Fenton Glass -Large Hanging Lamp - hand painted cameo depicting a Stern Wheeler named the Wagner. 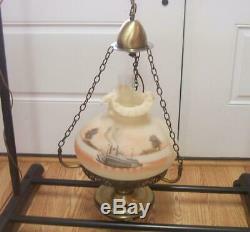 FENTON GLASS - "STERN WHEELER" LARGE SATIN CAMEO HANGING LAMP - "THE WAGNER". We are pleased to offer you this FENTON GLASS LARGE HANGING LAMP "THE STERN WHEELER NAMED WAGNER" SATIN CAMEO This fabulous large hanging lamp is hand painted depicting a Stern Wheeler named the "Wagner" (perhaps in tribute to Marilyn Wagner, one of Fenton's great artists). The shade, decorated in pastel brown and orange tones, measures 12" wide, 9" tall and has a three ruffled double crimped edge. The chimney measures 12 high. The brass metal frame has a 10" fitter ring and measures about 27" tall with cap and font and has an adjustable chain with plug. The lamp can be permanently wired or plugged in. Signed by artist "Fenton" Hand Painted by Beverly Cumberledge, the shade is in excellent condition but there is tarnish on the metal cap and font. The lamp is in excellent working condition. We try to take pictures from several angles and also offer the close-up feature so you can look carefully at the piece for yourself. We welcome any questions and thank you for viewing our item. We'd like to invite you to visit our store, Town Square Emporium! And be sure to check our feedback. We are very proud of it and we work hard every day to deserve it. Get Supersized Images & Free Image Hosting. Create your brand with Auctiva's. Attention Sellers - Get Templates Image Hosting, Scheduling at Auctiva. The item "FENTON GLASS STERN WHEELER LARGE SATIN CAMEO HANGING LAMP THE WAGNER" is in sale since Thursday, February 7, 2019. This item is in the category "Pottery & Glass\Glass\Art Glass\North American\Fenton". The seller is "townsquaremike" and is located in Akron, Ohio.